Order pizza, ask questions later. This has been the tried and true strategy of husbands, roommates, night owls, unsupervised children, and lonely bachelors for centuries (okay, maybe not centuries). No matter which way you slice it, pizza is the perfect combination of meaty goodness, healthy vegetables (for v—… veg—… vegetarians), crispy crust, and soul-soothing, transcendent, heavenly cheese. For your own safety, health, happiness, and spiritual enlightenment, you need Saugus pizza delivery from Vincenzo’s as soon as possible. Quick question: what are you eating for dinner tonight? Your dinner story could go one of two ways. I tossed a month-old TV dinner into my dirty microwave, and set the timer for three minutes. The smell of government cheese and homemade radiation permeated my apartment as the lukewarm piles of corn and test-tube mashed potatoes sizzled in their plastic compartments. I thought to myself, the only way to get this sucker hot enough is to cook the nutrients right out of it. That was a risk I was willing to take. Once my dinner was done cooking, I pulled it out of the microwave, being careful not to place my bare fingertips on the nearly molten plastic. The “all white meat” chicken tenders jiggled like jello as I set the tray on the counter. I carved into the rubbery chicken with a butterknife, struggling to slice through its somehow-still-slightly-frozen skin. What does “all white meat” mean anyway? What if some of the white meat isn’t even from a chicken? Once I finished my “food,” I sauntered over to the garbage to throw my tray away. By golly, I should’ve ordered a pizza. After 25 minutes of joyous anticipation, there was a friendly, rhythmic knock on the front door. It was the Vincenzo’s Pizza delivery guy—the same one who’s been delivering happiness to my Saugus doorstep for years. 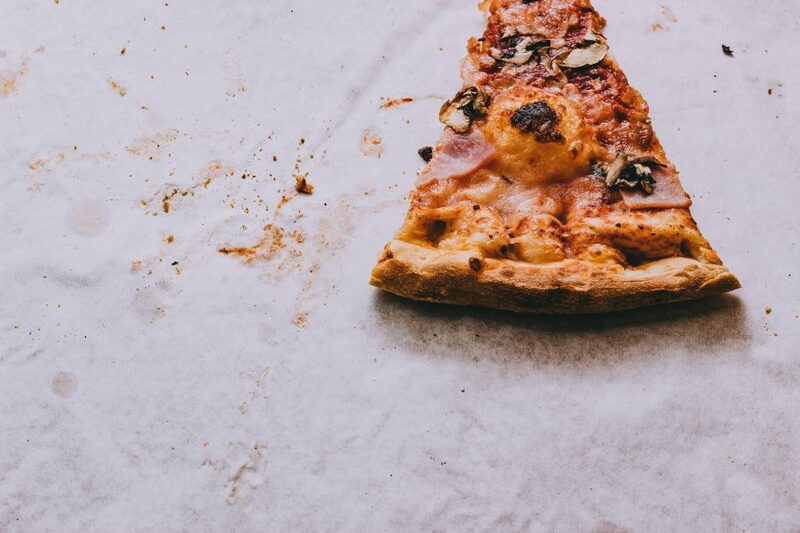 I swapped my inedible paper money for his pizza—no, MY pizza—and gently placed it on my coffee table. Once I swung open the lid, a barrage of smells tickled my nostrils: thick-cut pepperoni, canadian bacon, sausage and saucy meatballs, placed atop a cloud of divine mozzarella cheese. I took a bite into my first slice, and, for a moment, lost my sense of space and time. Meat Lovers? Is there not a word more fiercely passionate than love? After two more slices, I closed the box. I had no worries about the past or the future; at least I’d still have some pizza left for breakfast. The fate of your dinner experience rests in your hands. Choose wisely.